This is the first time in Montana for both of us. Columbia Falls is located southwest of the west entrance to Glacier National Park. We parked at the LaSalle RV Park. I don’t attempt to rank national parks and other places of natural beauty since each place offers something unique and special. 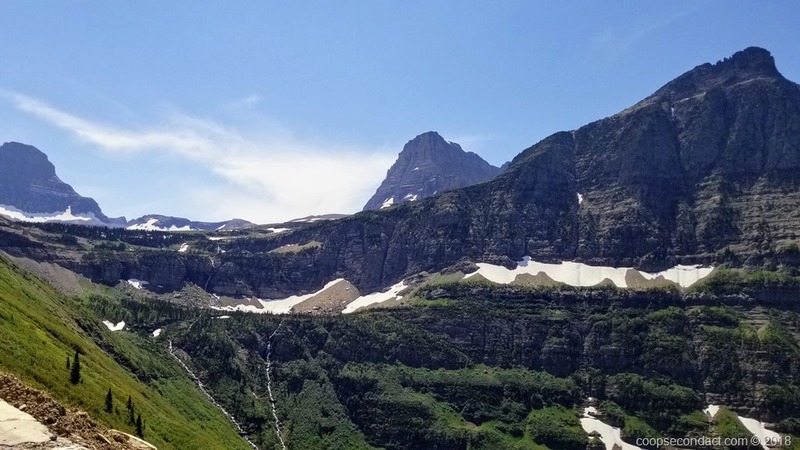 But suffice it to say that Glacier National Park gave us many opportunities to feel overwhelmed with the sheer scale and beauty of what we were seeing. This place that was carved and shaped by geological forces and glaciers occupies about one million acres in northwestern Montana. One of the first things you’ll learn about GNP is that it has a very unique geology. The mountain peaks and other rocks that you see are sedimentary rock that date back about 1.4 billion years. Rock this old should be buried many thousands of feet below the earth’s surface underneath more recently formed layers. This is the result of the massive uplifting, folding and faulting in the beds of rock that formerly lay in flat, parallel layers some 60 miles west of the park. This movement on the Lewis Overthrust Fault forced ancient Precambrian rock over top of Cretaceous rocks that are a mere 75 million years old. I don’t necessarily recommend coming here in mid-July since it can be crowded. The park has introduced a shuttle system to allow you to park your car and ride the shuttle to reach the major points in the park. On our first day we used the shuttle since we have had a good experience with the shuttles at Yosemite and Zion National Parks. But here it’s a little more complex since the upper portion of the “Going to the Sun” road is narrow and twisting so they have to use smaller vehicles. The result was that we spent a great deal of time waiting to get on a shuttle. So on subsequent days we arrived early and parked in the area we wanted to explore. What will you find here? Wildlife. We encountered mountain goats and bighorn sheep. We didn’t see moose but we were told that they are fairly common. There are about 700 lakes in GNP. We took a boat tour on the largest, Lake McDonald, and hiked to two very beautiful lakes, Hidden Lake and Avalanche Lake. Then there are the waterfalls. Everywhere you look there are beautiful waterfalls but many of them will dry up before the end of summer. Also, the 26 remaining glaciers are shrinking and will likely completely disappear by 2030 and this will bring changes to GNP in terms of temperature, water levels and wildlife. 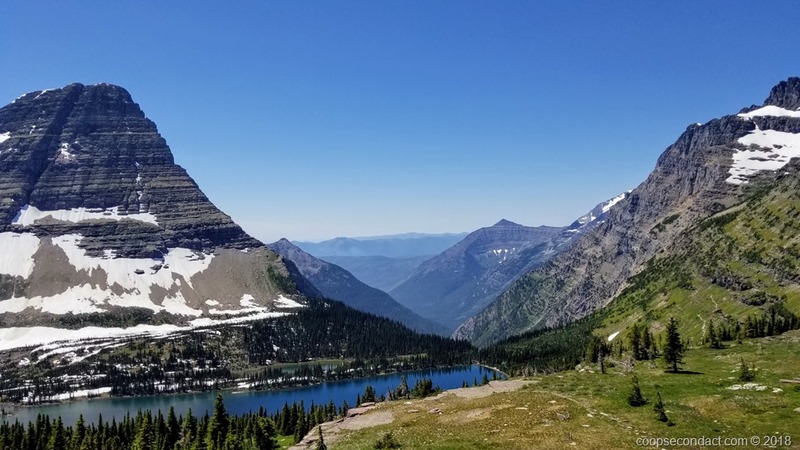 If you haven’t been to Glacier National Park, you can plan a trip to include Yellowstone and Grand Teton National Parks which are relatively close. We also took a side trip to nearby Whitefish, MT. It is a beautiful town on Lake Whitefish and with nearby Whitefish Mountain Resort on Big Mountain it offers recreation opportunities for visitors year round.